It's not often you find cookies that are free of the eight common allergens. No gluten! No wheat! No milk! No dairy! No peanuts! No tree nuts! No eggs! No soy! Taste and texture, that's what. Glorious taste and wonderful texture! It's hard to believe that these cookies could be any good, but they are! I was skeptical at first too. But I'm here to tell you that you don't have to be. I was, I braved it, and I came out the other side believing in these cookies! They are soft, with just a bit of chewiness to them, and sweetened nicely with fruit juice concentrates and brown cane sugar. I like them so much that I have a hard time only eating one or two. They are so nice to sink your teeth into. Nice bite. They are a bit on the sweet side. I liked them so much, I started trying to think about crumbling these up into crumbs and making them into a cookie pie crust for some sort of pie. No box of these has ever lasted long enough to be made into a cookie pie crust. The cookies themselves are small, but they are power packed with flavor! 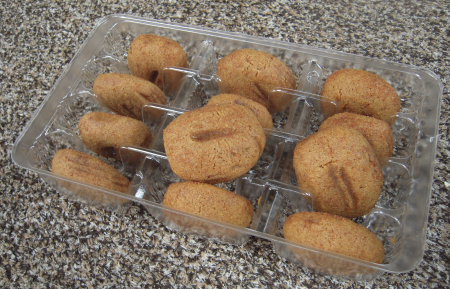 Cinnamon is prominent, but these are not really cinnamon cookies. They are sugar cookies with cinnamon. Surely, you know the difference between the two. 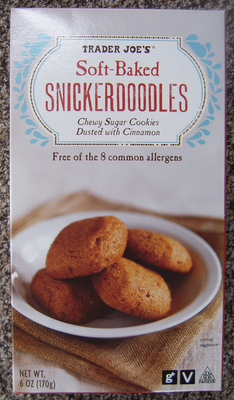 If you have a Trader Joe's within reach, run out and grab yourself some of these delectable little snickerdoodles! Your family won't hesitate to help you devour these little bites! LOVE THEM. Delicious chewy little puffs of mostly healthful goodness. Ingredients like dates and flaxseeds will make you feel guilt-free, but the scrumptious taste will leave you wondering if you shouldn't be ashamed of eating half the box before bed. YUM. Exactly like the Enjoy Life brand, only affordable!